Have you been referred to TrueNTH LM? Find a community program, sign up for a home program, or email lifestyle@truenth.ca for more info! Trained professionals offer community physical activity and yoga programs at locations throughout Canada. Use the secure portal to get a physical activity program you can do in the comfort of your own home. Health library of prostate cancer specific physical activity, stress-reduction, and nutrition resources. Want to be involved as a professional, advocate, or help bring a program to your area? Click here for more information. Trained fitness and yoga professionals across Canada provide community programs for men living with prostate cancer. Find a TrueNTH LM Community Program or Professional Near You! These programs are evidence-based so that your health concerns are addressed, you are kept safe, and that you enjoy every minute! Select your province to find the programs available near you. Contact lifestyle@truenth.ca to get more information and to find out about any future community programs that may be coming to your region! Address: 5 Inspiration Way, Brampton, ON. Program Offering: 12-week exercise and education program for all cancer survivors. Program Offering: A Registered Kinesiologist with Cancer and Exercise training is employed for fee-based individual exercise prescription services. Address: 3-3250 Schmon Parkway, Thorold, ON. Program Offering: 8-week exercise and education program for all cancer survivors. Address: 2545 Sixth Line, Oakville, ON. Address: 611 St. Clair St., Point Edward, ON. Program Location: Canada Games Complex, Thunder Bay, ON. Address: 585 University Avenue, Munk Building, B PMB 130, Toronto, ON. Address: 200 University Avenue West Waterloo, ON. Phone Number: 8-1-1 and ask to speak with "Physical Activity Services for Cancer"
Address: 409 Seymour St., Kamloops, BC. Address: 800 East Lake Blvd NE, Airdrie, AB. Program Offering: A Certified Exercise Physiologist with Cancer and Exercise training is employed for fee-based individual exercise prescription services. Address: 2000 Division Ave N., Medicine Hat, AB. Address: 3031 30th Av., Red Deer, AB. Address: 15 Peter Kelly Dr, Fredericton, NB. Program Offering: An Exercise Physiologist with Cancer and Exercise training is employed for fee-based individual exercise prescription services. Program Offering: A Certified Personal Trainer with Cancer and Exercise training is employed for fee-based individual exercise prescription services. Program Location: Rath Eastlink Community Centre: Truro, NS. Program Offering: An Exercise Physiologist with Cancer and Exercise training employed for fee-based individual exercise prescription services. Program Offering: Physiotherapist offering 1-on-1 sessions with cancer and exercise specific training as well as pelvic floor physiotherapy specific training. Address: 1390 Taylor Avenue, Winnipeg, MB. Program Offering: Fee-based ($60), 8-week (1 time per week) group fitness program for general cancer survivors. Program Offering: 3-month program for individuals living with a chronic disease, run by professionals with cancer and exercise specific training. Address: 4635 Côte-Sainte-Catherine, Montreal, QC. Program Offering: Personalized physical activity program and group yoga classes for all cancer survivors. Learn how to get active, stress less, and eat healthier from the comfort of your own home. Designed to meet your specific fitness and health-related needs. A comprehensive health library of evidence-based physical activity, stress-reduction, and nutrition videos and handouts. Become part of the Canada-wide network of health care and wellness professionals offering and promoting physical activity and wellness programs for prostate cancer survivors. Bring a program to your area, get trained to work with prostate cancer patients or start using TrueNTH LM resources in your practice. Referral and promotion materials for your clinic to educate patients on the importance of physical activity and wellness and direct them to program options. Fill out the order form below to request print versions or download them instantly via the links. Quick and easy tools to refer patients to lifestyle.truenth.ca. Fill out the order form below to request print versions or download them instantly via the links below. Simple posters to promote the importance of physical activity and programs for cancer survivors. Perfect for clinics and wellness centres. CLICK HERE TO VIEW THE ENTIRE PACKAGE OF RESOURCES. 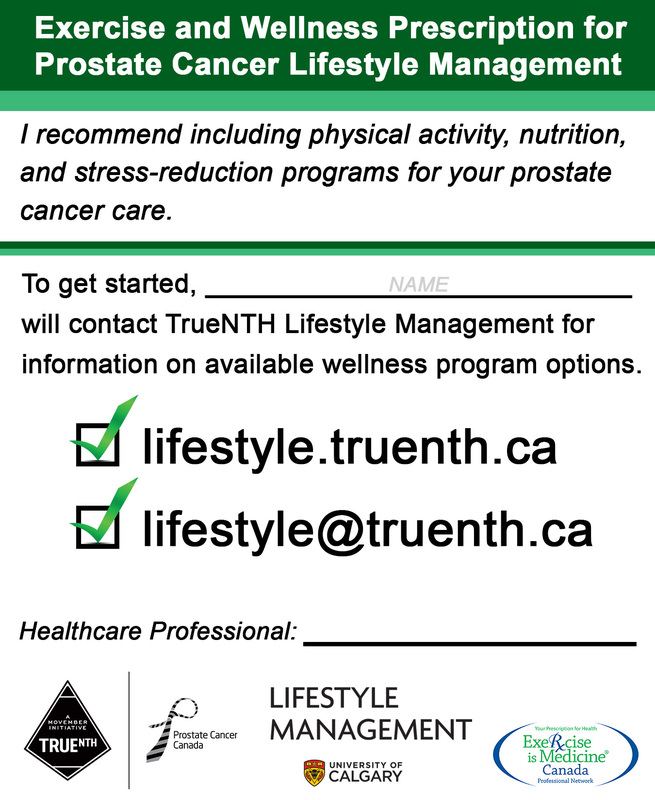 Healthcare professionals can formally refer men to visit lifestyle.truenth.ca to join a community program near them or access the free online programs & resources. A quick handout with comprehensive information on TrueNTH Lifestyle Management and the kind of programs and resources survivors can access. A series of 12 educational handouts on nutrition and dietary topics specific to the needs of men living with prostate cancer. Physical activity is beneficial to everyone’s health and it DOES NOT change for cancer patients. If it were a pill, everyone would take it. #MoveThatMan promotes physical activity among prostate cancer patients, survivors and families. SHARE your videos and pictures of the men in your life being active with the tag “#movethatman” to help promote physical activity among male cancer patients as a whole. Dancing? Walking the dog? Going to the gym? Playing with grandkids? Any kind of physical activity, we want to see it! Visit the “Community Programs” page and search by province to find local Canadian exercise programs and fitness professionals that cater to those living with cancer!